Tired of double-cupping your take-out coffee or using logo-splattered coffee cuffs? 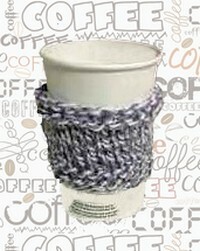 Knit your own coffee cozy, and protect your hands from those hot take-out coffees, with this free knitting pattern. Knit 3 rows and bind off tightly, leaving a long end to sew seam. Loosely cast on 22 stitches in main colour. Knit three rows then change to secondary colour. Change to main colour and knit 3 rows. Bind off tightly, leaving a long end to sew seam. Cheryl writes the Flotsam and Jetsam blog.